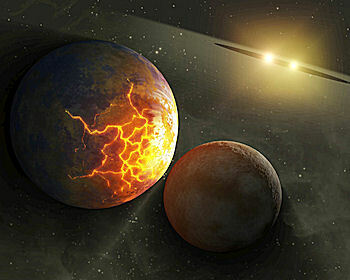 Planetary collisions such as shown in this artist’s rendering could be quite common in binary star systems where the stars are very close. It’s a good thing the Sun is single. 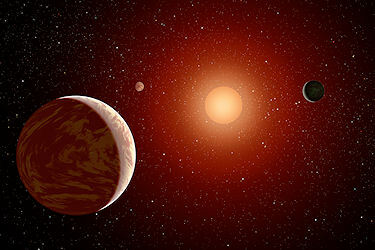 According to new research, Sun-like stars in close double-star systems “can be okay for a few billion years — but then they go bad,” says Jeremy Drake of the Harvard-Smithsonian Astrophysical Observatory in Cambridge, Mass. 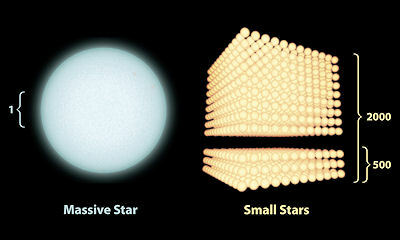 But some sun-like stars occur in close pairs only a few million miles apart. That’s only about five times the diameter of each star — so close the stars are gravitationally distorted. 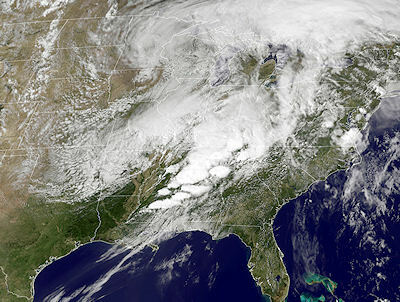 They are actually elongated toward each other. They also interact tidally, keeping just one face toward the other, as the Moon does toward Earth. Read more about these findings at the NASA Spitzer site at http://www.spitzer.caltech.edu/news/1182-ssc2010-07-Pulverized-Planet-Dust-May-Lie-Around-Double-Stars . For kids, the Spitzer Concentration game shows a big collection of memorable (if you’re good at the game) images from the Spitzer Space Telescope. 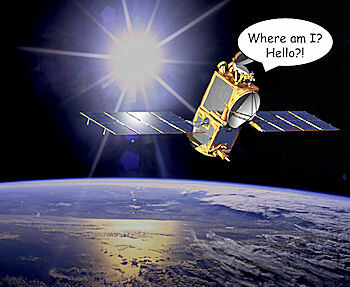 Visit http://spaceplace.nasa.gov/en/kids/spitzer/concentration/. 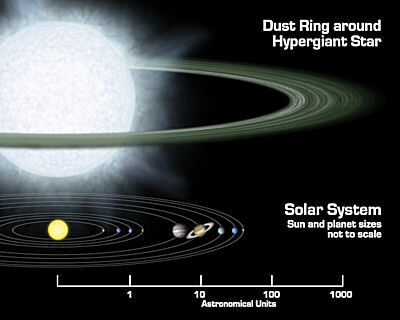 Artist’s rendering compares size of a hypothetical hypergiant star and its surrounding dusty disk to that of our solar system. These newfound disks represent “extremes of the environments in which planets might form,” Kastner said. “Not what you’d expect if you think our solar system is the rule.” Hypergiants and dwarfs? The Milky Way could be crowded with worlds circling every kind of star imaginable — very strange, indeed. 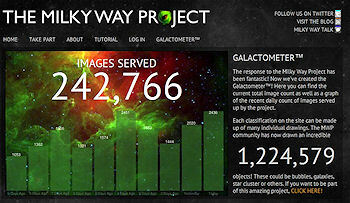 Keep up with the latest findings from the Spitzer at www.spitzer.caltech.edu. Kids and their grownup friends can enjoy beautiful images from Spitzer while playing Spitzer Concentration at The Space Place (spaceplace.nasa.gov/en/kids/spitzer/concentration). Superimposed on a Spitzer infrared photo of the Small Magellanic Cloud is an artist's illustration depicting a magnified view of a planetary nebula and an even further magnified view of buckyballs, which consist of 60 carbon atoms arranged like soccer balls. 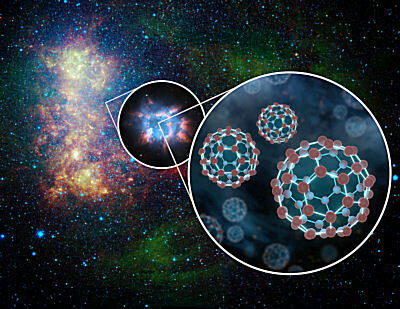 Although fullerenes have been sought in space for the last 25 years, ever since they were first identified in the laboratory, the astronomers practically stumbled into the discovery. Co-author Jeronimo Bernard-Salas of Cornell University, an expert in gas and dust in planetary nebulae, was doing routine research with Spitzer's infrared observations of planetary nebulae with its spectroscopy instrument. When he studied the spectrum (infrared signature) of a dim planetary nebula called TC 1 in the southern — hemisphere constellation of Ara, he noticed several clear peaks he had not seen before in the spectra of other planetary nebulae. 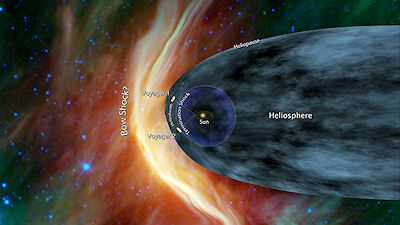 Learn more about this discovery at http://www.spitzer.caltech.edu. For kids, there are lots of beautiful Spitzer images to match up in the Spitzer Concentration game at http://spaceplace.nasa.gov/en/kids/spitzer/concentration.